With early voting underway in North Carolina, black and Democratic voters are being wrongly purged from the rolls. 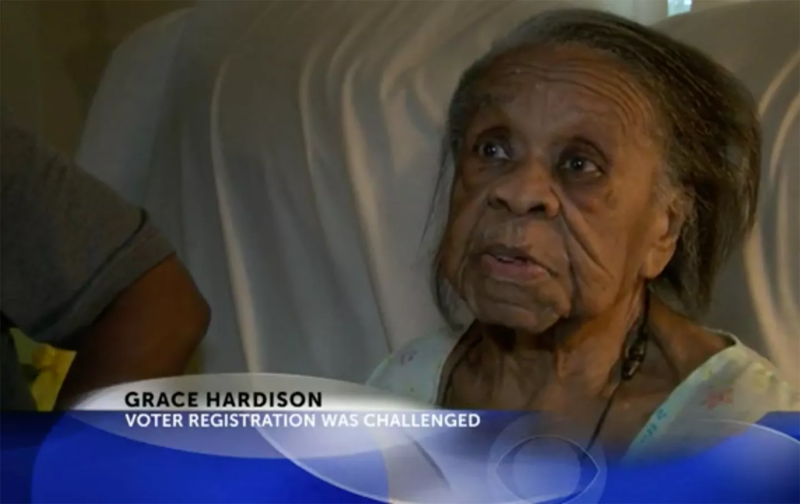 Just weeks before early voting began in North Carolina, Grace Bell Hardison, a 100-year-old African-American woman, was informed that her voter-registration status was being challenged. If she didn’t appear at a county Board of Elections meeting or return a notarized form, she would be removed from the voting rolls. Hardison’s registration was challenged by Shane Hubers, a Belhaven Republican, after a mailing done last year by a candidate for mayor. Mail that was returned as undeliverable in 2015 became the basis for the challenge list. The challenge list compiled by Republicans also overwhelmingly targeted black and Democratic voters. “Of the 138 challenged, 92 of them were black and registered Democrats. 28 voters were unaffiliated, 17 were Republicans, and 1 was Libertarian,” reported WNCT. Hardison’s challenge was withdrawn after a local outcry, but 14 voters have been purged so far in recent weeks in Beaufort County, which previously had to approve its voting changes with the federal government under the Voting Rights Act because of a history of discrimination. “These purges have a long history of being racial and inaccurate,” says Penda Hair, a lawyer for the North Carolina NAACP. Since October 4, 2016, four individuals have submitted forms challenging 139 registered voters in Beaufort County. While several of these challenges have been withdrawn or resolved by the Beaufort County Board of Elections, 103 challenges are still pending and have been scheduled for hearings on October 24 and 29. Over 60% of the challenged voters are African American. The challenge list includes 59 active voters, including 19 individuals who have voted in the last year. Among the challenged voters are Sharon Woods and Mary Harris Butcher. Ms. Woods is a 42-year-old African American resident of Beaufort County who has voted in the county since 2001. Ms. Woods has voted in Beaufort County fifteen times, including when she cast her ballot in person in the March 2016 primary election. Mary Harris Butcher is a 75-year-old African American resident of Beaufort County who has voted in the county since 1994. Like Ms. Woods, Ms. Butcher voted in person as recently as the March 2016 primary election. The GOP-led voter challenges in North Carolina appear very similar to the type of voter purging and intimidation the RNC is prohibited from doing. Trump has falsely and repeatedly told his supporters that the November 8 election will be “rigged” based upon fabricated claims of voter fraud in “certain areas” or “certain sections” of key states. Unsurprisingly, those “certain areas” are exclusively communities in which large minority voting populations reside. Notwithstanding that no evidence of such fraud actually exists, Trump has encouraged his supporters to do whatever it takes to stop it—“You’ve got to get everybody to go out and watch…and when [I] say ‘watch,’ you know what I’m talking about, right?”—and has been actively organizing “election observers” to monitor polling stations in “certain areas.” Trump has even encouraged his “watchers” to act like vigilante law enforcement officers. The lawsuit notes that one of Trump’s top advisers, Roger Stone, “was a key advisor to the 1981 campaign of former New Jersey Governor Thomas Kean, in which a ‘ballot security’ force wearing black armbands engaged in widespread voter intimidation in Newark, Camden, Paterson and other minority neighborhoods in the State, leading to this very action and the Consent Decree that Stone is helping to violate today.” The Huffington Post reported yesterday that Stone planned to send poll monitors to nine cities with large minority populations, using fake ID badges and to conduct fake exit polling. “We have three major voter suppression operations under way,” a Trump senior official told Bloomberg today. According to Bloomberg, the campaign is trying to depress turnout among “idealistic white liberals, young women, and African Americans.” Though this sounds more like negative campaigning than actual suppression, it isn’t likely to help the RNC’s case in court. As we’re seeing in states like North Carolina, the GOP is going to great lengths to make it harder for Democratic-leaning voters—including a 100-year-old woman—to cast a ballot.